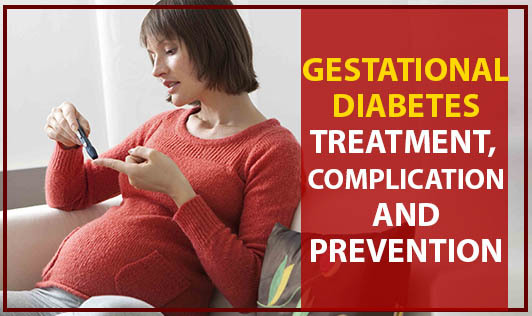 Gestational diabetes is a temporary condition that occurs during pregnancy. It has an increased risk of developing diabetes for both mother and child. Treatment: The goals of treatment are to keep blood sugar (glucose) levels within normal limits during the pregnancy, and to make sure that the growing baby is healthy. • Watching your baby: Your doctor should closely check both you and your baby throughout the pregnancy. Foetal monitoring to check the size and health of the foetus often includes ultrasound and non-stress tests. • Diet and exercise: The best way to improve your diet is by eating a variety of healthy foods. You should learn how to read food labels, and check them when making food decisions. Talk to a dietitian about your diet plans and discuss your exercise regime with your doctor. Prevention: Beginning prenatal care early and having regular prenatal visits helps improve your health and the health of your baby. Knowing the risk factors for gestational diabetes and having prenatal screening at 24 - 28 weeks into the pregnancy will help detect gestational diabetes early. If you are overweight, decreasing your body mass index (BMI) to a normal range before you get pregnant will decrease your risk of developing gestational diabetes.